South Gallia sophomore Amaya Howell (2) attempts to drive toward the basket against River Valley defenders Carly Gilmore (32) and Cierra Roberts (1) during Wednesday night’s girls varsity basketball game in Mercerville, Ohio. 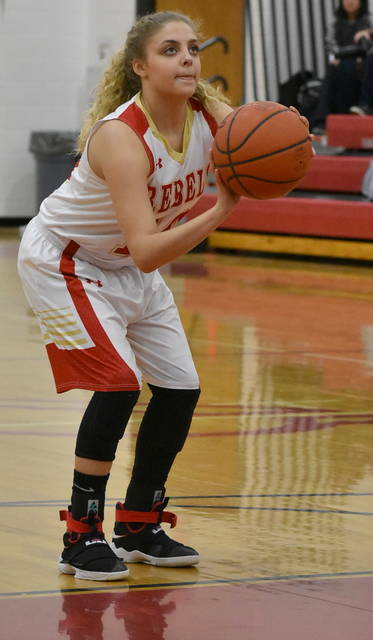 MERCERVILLE, Ohio — Despite a slow start, a strong finish led to a season sweep for the Lady Rebels. 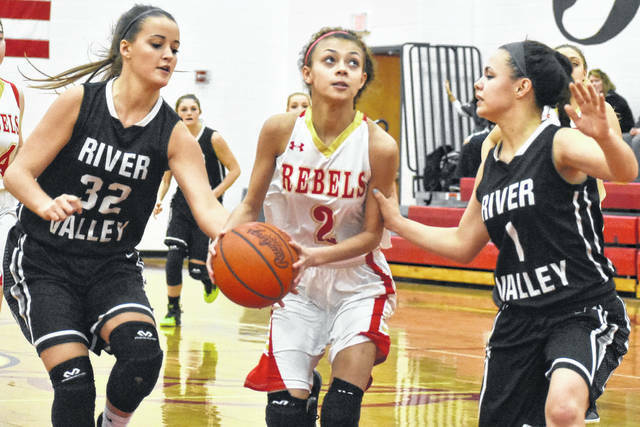 Visiting River Valley held the hosts to just three points in the first quarter on Monday night, but South Gallia eventually dominated the rest of the way and prevailed in a 41-32 victory over the Lady Raiders in a non-conference girls basketball contest between Gallia County programs. Both teams struggled to hit the net in the first period as SGHS (4-9) made 1-of-12 shot attempts from the field, which included a 0-of-2 performance from beyond the arc. Faith Poling provided all of the Red and Gold’s scoring in the first period, with one field goal and a 1-of-2 performance from the charity stripe. The Lady Raiders (0-12) took their early advantage as Cierra Roberts and Hannah Jacks each had tallies from the field. Overall, RVHS made 2-of-7 shot attempts from the field for 28 percent, which included a 0-of-2 performance from three-point range. South Gallia pulled away in the second quarter, as they made 6-of-17 shot attempts for 35 percent. The hosts benefited from a barrage of turnovers by the visitors, as the Silver and Black committed eight giveaways. In contrast, SGHS committed just four turnovers in the second period and entered the locker room with a 20-13 advantage. The Lady Rebels propelled out to a seven-point lead on the heels of senior Aaliyah Howell’s scoring eruption in the second period. Howell — who finished the night with a game-high 16 points — scored 12 points in the second frame, including a 4-of-4 effort from the charity stripe. Both teams ended the first half with 13 rebounds. 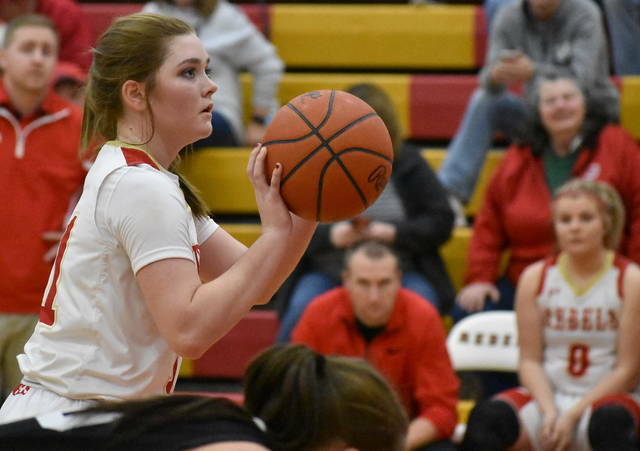 While SGHS held a seven-point advantage on the scoreboard, RVHS committed seven more turnovers over that same span with 17 giveaways — compared to 10 by the Lady Rebels. South Gallia remained ahead by seven points through the third period as both teams scored eight points apiece. The hosts made 3-of-14 attempts from the field and the Lady Rebels went 3-of-15, including a 1-of-8 effort from three-point range. River Valley committed just two turnovers in the third quarter and crashed the boards for eight rebounds. South Gallia gave away the ball five times as it gathered 10 rebounds. The Silver and Black looked to rally in the initial minutes of the final period as Kaylee Gillman pulled the Lady Raiders within four points (28-24) with a trifecta at the 6:07 mark. South Gallia’s Erin Evans, however, pushed her team back out to a 31-24 advantage with 5:28 remaining when she answered with a shot from beyond the arc. From there, SGHS carried the game’s momentum with a 10-8 run and wrapped up the nine-point victory. South Gallia also earned a season sweep of the Lady Raiders with a 55-48 win on Dec. 16, 2017, in Bidwell. The Lady Rebels made 15 total field goals — including two trifectas — in the contest, as Aaliyah Howell led the charge with 16 points. Evans was next with nine points, while Christine Griffith and Poling respectively chipped in six and five markers. Amaya Howell was next with four points, while Kiley Stapleton rounded out the scoring with one tally. The Lady Raiders netted 11 total field goals — including four three-pointers — and received a double-figure performance from Jacks with 10 points. Gillman and Jaden Neal were next with nine markers apiece. Roberts and Kelsey Brown completed the scoring with two points each. Both teams returned to action Thursday as South Gallia traveled to OVCS and River Valley hosted Meigs.